If you are searching for a way to get a lush, green lawn without having to break the bank or spend countless hours of trial and error work, look no further! We offer residential and commercial lawn fertilization services to both Weber and Davis counties in Utah. At Big League Lawns, our lawn fertilization experts specialize at turning patchy, dull lawns into thick, beautiful lawns. We offer a FREE lawn analysis during which we'll work with you to determine your needs and develop a game plan to reach your goals. Hit a home run with your lawn fertilization company in Utah. Contact Big League Lawns to see how we can help! Big League Lawns is locally owned and operated in Utah, which means that we have extensive knowledge of the soil in this area to yield the best results. We offer a free evaluation of your lawn where we analyze the soil, look for evidence of turf disease, and examine the existing quality of your grass weed or insect problems. At the end of this evaluation, if you choose to go ahead with our services, we will blend together a lawn fertilizer that is specifically customized for your lawn and use it to help you achieve the lush, healthy lawn you've always wanted. Maintaining a lush, green lawn all starts with fertilization. The right lawn fertilizer can do wonders for any lawn, transforming it in no time at all. Yet finding the right blend of fertilizer and determining how much you should use can be confusing. What lawn fertilizer to use? When to fertilize? How much fertilizer? The truth is, lawn care is a science. When individuals try to fertilize their lawns on their own, this complexity can lead to frustration and errors - neither of which ends up producing a great result. Even worse, individuals often end up using too much or not enough fertilizer, costing time and money, and leaving your lawn looking worse than it did when you started. In the end, this frustrating trial and error process will often end up costing you more than it would have cost to hire professional help in the first place. Working with Big League Lawns takes out all of the guesswork and hassle associated with fertilizing a lawn. 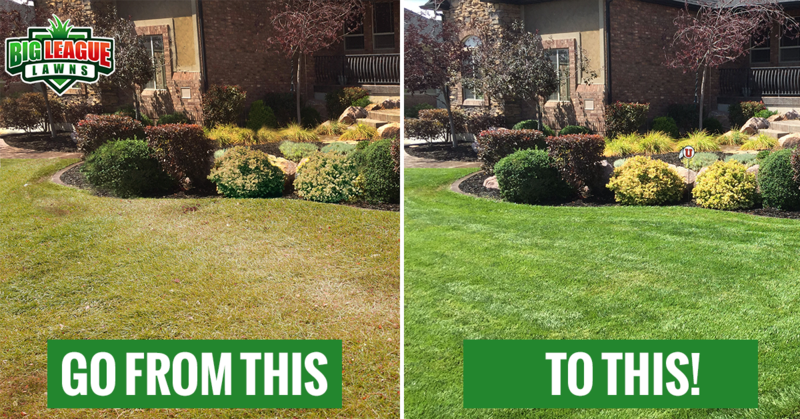 Our tailored approach ensures that your Utah lawn receives the exact kind and amount of fertilizer it needs to grow to its full potential. We put the effort and research into get it right the first time and provide you with a top-quality lawn. We perform lawn fertilization in stages in order to ensure optimal results. With every lawn we fertilize, we stand by our services, guaranteeing your satisfaction with our work. If you would like to learn more about our lawn fertilization services and schedule your free lawn evaluation, contact us today.